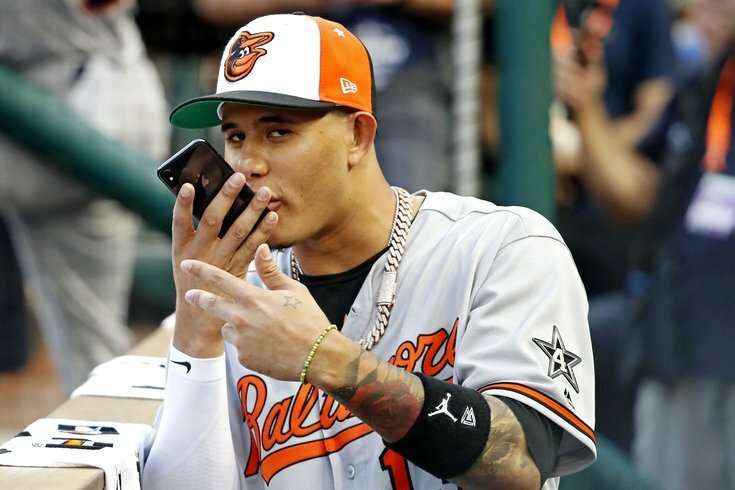 Manny Machado takes a call before the 2018 MLB All Star Game at Nationals Ballpark. Once again, the “Welcome to Philadelphia” entrance mat was pulled out from under the feet of Philadelphia sports fans over the past few days. The latest missteps occurred when it became apparent that the Phillies would be unsuccessful in their attempt to acquire Manny Machado, and the Sixers had to deal with Kawhi Leonard being traded to the Toronto Raptors. The inability to land those two stars came just a short time after LeBron James dismissed the Sixers desire to bring him on board, and a few weeks after it was learned that New York Islanders free agent John Tavares did not even have the Flyers on his list of desirable teams before signing in Toronto with the Maple Leafs. There is no way to feel good about the fact that the Phils, Sixers or Flyers were not able to land the biggest prizes. The Flyers made a nice signing when they got James van Riemsdyk back for a relatively short five-year deal, but that did not ring the bell like Tavares. At this point, the biggest bruise appears to be the Phillies. For at least a couple of days leading up to the All Star game, it appeared that Phillies general manager Matt Klentak had enough in the farm system to engineer a deal with the Baltimore Orioles to land Machado. Machado was a perfect fit — even if just a rental. The Phillies have been living on a corn flake of success, depending on Scott Kingery at shortstop and Mikal Franco at third base. Shortstop has become a power position, and Kingery does not fill the bill. Even if it was short-term, Machado was a huge upgrade for the second half of this season. He was the bat they needed at the plate, and the power-surge they needed on the field and the box office. Machado would have changed the dynamics on so many levels, and a still dormant fan base was waiting for the delivery. Well, the package never arrived. The Los Angeles Dodgers swooped in from the west and offered a sweeter deal in terms of prospects. From the outside, it would be logical that the Orioles wanted the Phils to include their top pitching prospect Sixto Sanchez, and you can hardly blame the Phillies for declining. The Phillies now face a plan “B” that is likely to include a starting left-handed pitcher, a bullpen arm, and perhaps Kansas City’s left-handed hitting third baseman Mike Moustakas. If Klentak can get that done, it will help make up for the inability to get Machado. The problem is that the team getting Machado got the deal done because the Dodgers think they can win the World Series THIS year. If Machado is indeed in the Dodgers lineup when they arrive in Philadelphia next week it won’t just be a farewell for local icon Chase Utley. The dark side of that series could be an up close look at what the Phillies are missing in Machado. The Dodgers don’t just think they can win a World Series this season, they also believe they think they have a good chance of signing him long term after this season. If Machado gets a taste of success with the Dodgers he is more likely to want to stay — and you have to wonder if that would not have been the case in Philadelphia. Either that, or you wonder if the Phillies brass didn’t really think the team had a shot to win it all, even with Machado, and then became unwilling to up the offer with more prospects, or even the top prospect. No matter how you spin it — even if you believe the Phillies should not have gone an extra mile to get Machado — you can’t deny the level of enthusiasm would have been sky high if the deal was made. Instead, they are looking elsewhere to pump up the tires for a second-half run. An even worse situation occurred almost at the same time, when the San Antonio Spurs made a deal with the Toronto Raptors, sending Leonard to Toronto. Again, this is a rental as Leonard has made it pretty clear he wants to play in Los Angeles with either the Lakers or Clippers next season when he can be signed as a free agent. The Sixers were certainly in play to get Leonard, and they even had a high draft choice to use, the result of a trade on draft day. Since the end of the season, the prospects for the Sixers have been shaken, beginning with the front office instability with former general manager Bryan Colangelo’s twitter problems. At least when LeBron James went to the Lakers it meant he was leaving the East, and the highway to the finals looked like a two-lane highway with the Sixers and Boston Celtics. If the Sixers could have landed Leonard they would have been in a lot better shape to face the Celtics. Well, that two-lane highway is now a three-way highway with the Raptors. Although the Raptors have a history of post season fizzle, this move not only helps their chances, but it diminished the Sixers. Oh well, the Eagles open camp next week and all will seem well.